We all like to bash Microsoft and Windows, but the truth is that they have been around for so long and given us so much software and technology, that we couldn’t possibly imagine a computing world without them. Their software is installed by default onto every new PC (whether we like it or not) and who do you know that doesn’t know Word or Powerpoint? Or how many young people don’t know what an XBox is? Not many I would imagine. 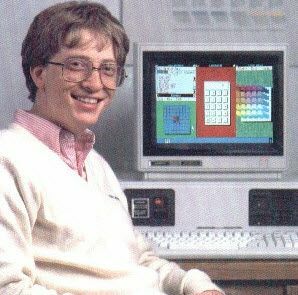 Despite the best efforts of Linux developers to break Bill Gates’ stranglehold on computers, the chances are that if you walk into a shop and buy a new PC, it’s going to have the latest version of Windows and Office on it. And despite the rather high costs involved in upgrading the operating system and Office, it is an operating system that people can more or less pick up from day one. There’s no steep learning curve, no instruction manual. To use the rather over-used cliche, “even your granny could use it”. Below is our infographic today, which shows the evolution of Microsoft and the technology they have given us over the years, with Bill Gates and Paul Allen forming Microsoft way back in the year of my birth, 1975, with Windows 1.0 coming out a decade later. Today we are on Windows 8 and the company has come far, despite ferocious competition from Cupertino. Let us know what you think of the infographic in the comments. Are you old enough to remember some of these really old events? What would you say was Microsoft’s defining moment in the infographic’s timeline? Explore more about: Infographic, Microsoft, Windows 7, Windows 8. Windows 8 will kill Microsoft. Great Info graphic. Much easier than reading Wikipedia. I do like it but I guess they want to forget some of the rubbish like millennium and vista but why Windows 98 though? 98, 2000(ME), vista isn't included? They forgot Windows 98, the Second Edition was the best of its time. Then came Windows 2000 which was the most stable version. Vista and the old Millenium Edition were huge miss.